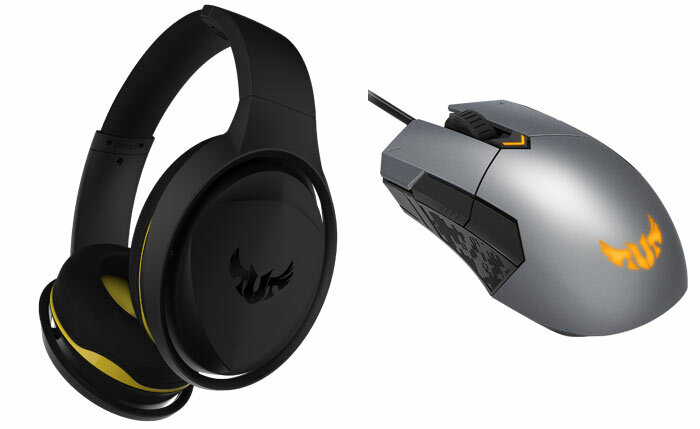 Asus has emailed HEXUS to pre-announce its new range of TUF gaming products. 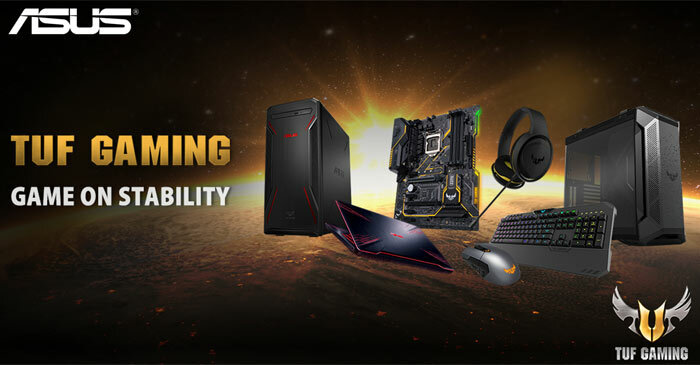 As well as full systems like the TUF Gaming FX10CP desktop and FX504 laptop, Asus will be showing off its new TUF Gaming M5 mouse, TUF Gaming K5 keyboard, TUF Gaming H5 headset, and TUF Gaming GT501 at the ASUS booth, #M410 in Nangang Hall, from 5-9th June. Additionally Asus has collaborated with like-minded partners to produce 'TUF Gaming Alliance' components. Thus you will see PC bits and pieces from brands such as Antec, Apacer, Ballistix, Cooler Master, Corsair, Deepcool, Enermax, G.Skill, GeIL, In Win, Scythe, Silver Stone, Team Group, and XPG begin to appear with TUF logos on the packaging. As a reminder, the TUF (The Ultimate Force) products are made to provide reliability and performance at an affordable price. The new TUF Gaming FX10CP desktop features Asus Radiating X design with dual internal chambers (PSU and storage in the lower chamber). Inside you will find up to an Intel Core i7-8700 six-core CPU and NVIDIA GeForce GTX 1050 graphics. 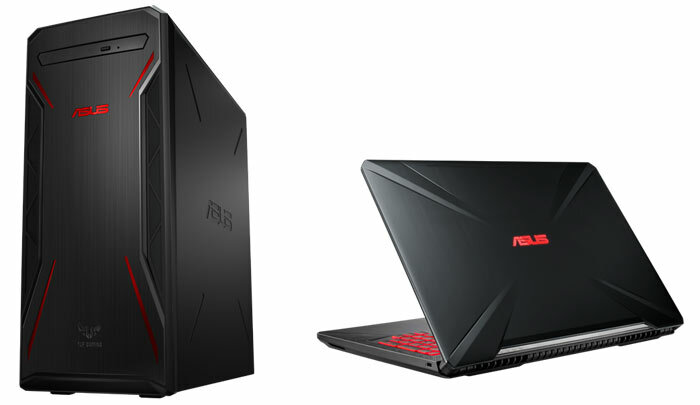 Asus says that it is ideal for gaming (1080p I guess) and other tasks, like catching up on work, editing photos, or splicing together in-game recordings. Other niceties are built in Intel 802.11ac Wave 2 Wi-Fi. The TUF Gaming FX504 laptop is built around a 15.6-inch display and the top model boasts a 120Hz refresh, 3ms grey to grey response time, and a 130 per cent coverage of the sRGB gamut. For processing power the laptop offers up to a six-core Intel Core i7-8750H processor, with up to an Nvidia GeForce GTX 1060 GPU for graphics processing duties. Asus claims that the TUF Gaming FX504 can easily hit triple-digit frame rates in many popular titles. Again it comes with Intel 802.11ac Wave 2 Wi-Fi. This laptop measures about an inch thick and weighs in at approx 2.25kg. As the TUF branding implies, it is said to be rugged enough for lugging around, helped with its dust-proofing tech. Furthermore, its 'desktop-style keyboard' is decked out with key switches rated for 20 million presses. 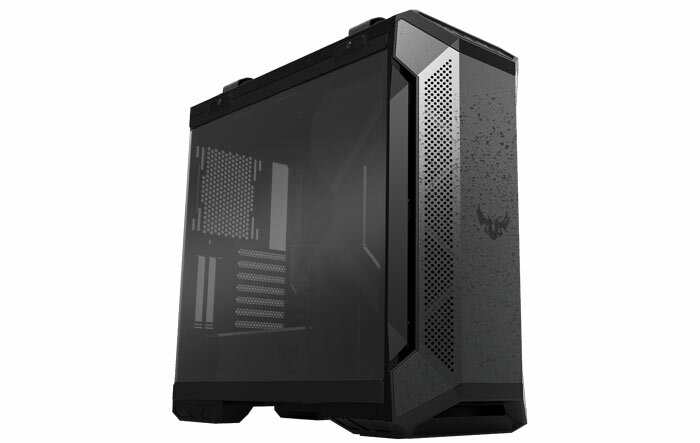 The Asus TUF Gaming GT501 case features steel construction with some plastic panel connectors and feet, and a smoked toughened glass side panel. The chassis is built with consideration for good cable management, cooling (air or water), with radiator support up to 360mm. Removable filters keep the dust ingress to a minimum. If you are looking for a new gaming headset, the Asus TUF Gaming H5 might appeal. It features a careful balance of durability and comfort. For example it uses a steel headband but a lightweight design for comfort over long durations. For audio you have a 50-mm Essence driver backed by an airtight chamber over each ear. A removable boom is fitted. Users can plug into a standard 3.5mm audio out or via an included USB adaptor for virtual surround sound. The TUF Gaming M5 mouse features a durable double layer paint finish, with Teflon coating underneath. Inside you will find 50 million click rated Omron switches (left and right) and the Pixart PAW3327 optical sensor (resolutions up to 6200 DPI). Additional buttons include the DPI switch, the click wheel, and two thumb buttons. Both this mouse and the K5 keyboard, below, can be configured using Armoury II software (lighting, macros etc). On board memory means that three stored profiles can be toggled without the PC software being present. The Asus TUF Gaming K5 keyboard is headlined as a splash proof design. It can specifically withstand a torrent of liquid of up to 60ml. For comfortable and responsive action this model features Mech-Brane switches. Dedicated volume and media keys are built-in for convenience too. Key caps use a triple paint layer for durability and there is five-zone Aura Sync backlighting feature. The above new TUF products will be made available in Q3 2018. Pricing will be revealed nearer to release. 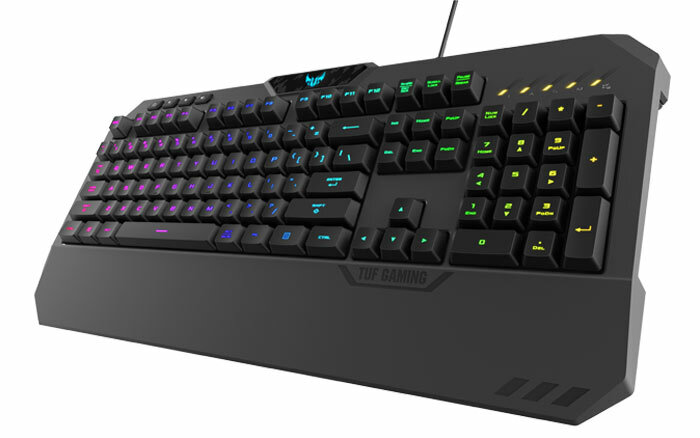 Definitely got my eye on that keyboard, I am looking for an aura sync capable one that doesn't use loud “clicky” switches and also doesn't cost more than a decent SSD. Might not be as flashy as a claymore for example, but if the price is right I would be a lot happier justifying this. Why the hell would you put an i7-8700 next to a GTX 1050 in a desktop? Torrent might be stretching it a bit. The design is a bit garish too IMO, hope they continue to iterate on it though. In the market for a more substantial splash-proof mechanical keyboard.